Performance Shafts;35 percent stronger than OE;10 year Limited warranty; Dana 35;Right Hand, 27 Spline Don’t just replace your axle shafts, upgrade them. 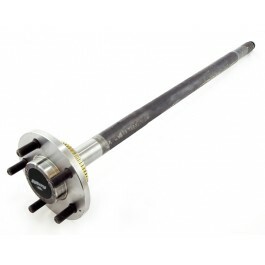 For less than the cost or an original replacement axle shaft you can upgrade to an Alloy USA™ performance shaft. Wheel bearings, seals and wheel studs available separately. Each shaft is backed by our exclusive 10-year Limited warranty. Alloy USA uses high strength 4140 Chromoly in all its Jeep axles. Our axles are heat-treated twice and induction hardened to produce these heavy-duty axles that are up to 35% stronger than stock 1040 axles. Alloy USAÉ uses the latest cold spline rolling technology, to produce splines that are stronger than traditional cut splines. Our shafts are covered by an exclusive 10-year warranty!